Article first published as TV Review: HARD SUN on Seat42F. 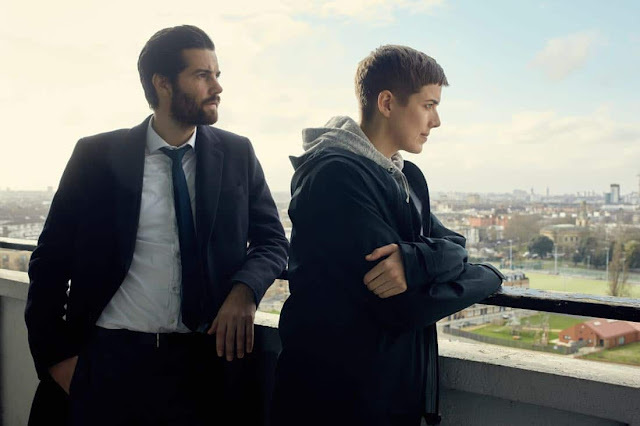 Hulu premiered all six episodes of a new drama called HARD SUN last week. A co-production with the BBC, HARD SUN follows two cops in a pre-apocalyptic world. Yes, pre-, not post-. An event known only as “hard sun” (hence the title of the show) is being kept secret by the government, even though it predicts an extinction-level event in a mere five years time. As more people begin to find out about it and react, our heroes not only have to continue to do their jobs keeping the peace, but they also get drawn into the conspiracy coverup. HARD SUN sounds like a really neat idea. After all, so much time has been spent examining how people would deal with the aftermath of a big event. It’s cool to finally get into the psychology of how they would react when the disaster is looming, but has not yet arrived. Painting it as a secret that leaks out and is, at first, only believed by conspiracy nuts makes it all the more intriguing because the series can take its time getting around to various types of people reacting differently to the news. The problem is, HARD SUN doesn’t really delve into the psychiatry so much as uses it as a distraction from the main story. Several of the six hours are mostly made up of our leads trying to catch a bad guy doing something horrible because he (always he) believes the world is ending. This could be very interesting if the focus wasn’t just on catching him, or if there were more variation in the execution. But despite some good guest star turns here, these stories are mostly unsatisfying and seem to just be in the way of getting back to the plot most viewers will care more about. This is the way a 22-episode network season would stretch things out; it doesn’t work for a six-episode short season. The through line story is pretty good, but HARD SUN spends too much time ignoring it. DCI Charlie Hicks (Jim Sturgess, Feed the Beast) is a complicated man. He cares deeply for people and wants to protect them, and has done some pretty bad things while pursuing that goal. His new partner, DI Elaine Renko (Agyness Deyn, Hail, Caesar! ), is put in place specifically to catch him, until she bonds with him during their duties. She also has her own issues, with a violent son she loves, despite the fact that he tried to kill her. This baggage is pretty inconvenient when Hicks and Renko have to spend so much time avoiding would-be assassins from MI5, in particular Grace Morrigan (Nikki Amuka-Bird, Luther). That is a LOT of story just for our two leads, so having to watch them do their jobs around it is too much. HARD SUN should have just focused on the complex set of circumstances they built, and if we saw Hicks and Renko working at all, keep it to routine duties or a single case, not extra-complicated serial killers. I admit, I was caught up in HARD SUN, watching all six hours before sitting down to write this review. Part of the reason I waited was to see if the end paid off the time spent slogging through the middle hours. It does, with bright promise for a second season, should one be ordered. But that doesn’t change the criticism above, which still stands upon completion. I expected a bit more from writer Neil Cross, who is best known for his excellent British crime series, Luther. Also, HARD SUN is very graphically violent. If that bothers you, you might want to skip it. HARD SUN season one is available now on Hulu.